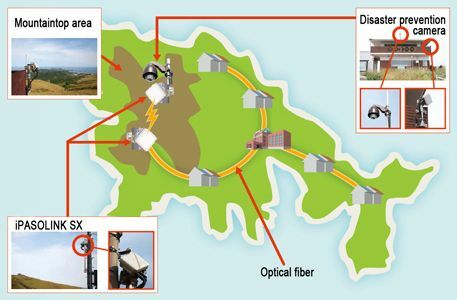 Tokyo, July 27, 2015 - NEC Corporation (NEC; TSE: 6701) today announced the adoption of its iPASOLINK SX ultra-compact microwave communications system by the village of Chibu in western Japan as the communications infrastructure for its disaster prevention camera system. The iPASOLINK SX systems have been installed in order to relay video footage from disaster prevention cameras around the village in real-time to a monitoring center inside the Chibu village office. The system began full-scale operation in April 2015. The village of Chibu has a progressively aging population and is working on initiatives such as welfare services for elderly citizens and improvement of its disaster prevention network. As a part of these initiatives, Chibu installed multiple disaster prevention cameras in hilly areas within the village with 360-degree visibility, and introduced a system for constant monitoring of weather conditions and sea-surface roughness from the village office. Under standard conditions, a network of optical fibers is usually used for relaying large volumes of data such as video footage from surveillance cameras. However, Chibu's disaster prevention cameras are installed in a hilly region where the laying of optical fibers poses difficulties. Furthermore, the area is designated as a specially protected region by the Japanese government, and restrictions are placed on the laying of fibers in order to preserve the natural scenery of the area. NEC offered the iPASOLINK SX to Chibu as a solution that enables the realization of high-capacity data transmission without the use of optical fibers, and constructed a wireless radio network for relaying footage from the disaster prevention cameras to the monitoring center in the Chibu village office. iPASOLINK SX is a communications system that links two remote points via a high-speed, high-capacity wireless radio network, and is capable of maximum transmission speeds of 320Mbps. As the system does not require large-scale installation work as with optic fiber networks and uses a 60GHz frequency band for which no license is required, it enables networks to be constructed within a short period of time. The system also has a high-level of waterproof and dustproof performance, and is equipped with features such as Advanced Error Correction and Adaptive Modulation Radio functionality for enhanced transmission quality, making it ideal for use as the communications infrastructure for disaster prevention networks that demand high levels of reliability. "The mountaintop area in which our disaster prevention cameras are installed is prone to being affected by heavy storms and typhoons. In order to prevent problems such as degraded signal quality due to rough weather or interruptions in transmission if the angle of an antenna changes due to strong winds, the system for relaying the video footage needs to be highly reliable and have high-level environmental resistance capabilities," said Hisashi Tokuda of Chibu's General Affairs Division. "Since the introduction of iPASOLINK SX no transmission faults or equipment failures have occurred whatsoever, and the system has become an indispensable part of our disaster prevention network, supporting the safety and peace of mind of our citizens." "The iPASOLINK series was the ideal solution for Chibu's system due to its high-level of environmental resistance and reliability, which have been highly acclaimed by customers all over the world," said Atsushi Noro, General Manager, Mobile Wireless Solutions Division, NEC Corporation. "As a new application for the series, we are very pleased that iPASOLINK SX has been adopted for use in a mission-critical disaster prevention network." NEC's PASOLINK series has shipped more than 2.5 million units (*), and the system has been supplied throughout a full spectrum of environments in 153 countries (*) worldwide, from the extreme cold of Russia's Siberia to harsh, sun-scorched desert regions.